A 2 Years minimum service for Promotions or Appointments by transfer to next higher category. 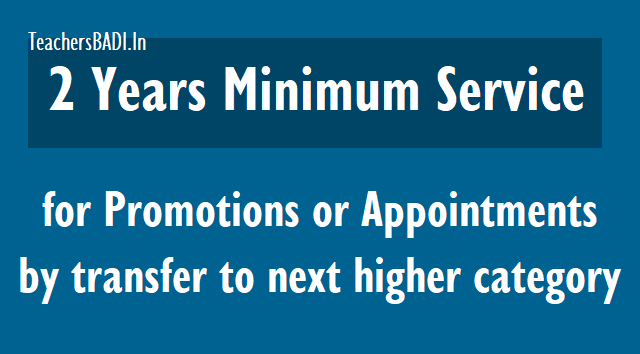 Minimum Service for Promotions is Reduced to 2 Years. A minimum service of 2 years is stipulated in the category, class or grade from which promotion or appointment by transfer is proposed to the next higher category, class or grade. GO.No.85 Stipulation of minimum service for promotion or appointment by transfer to next higher category. Public Services – State and Subordinate services - Stipulation of minimum service for promotion or appointment by transfer to next higher category - Adhoc Rule - Issued. 6. From the Joint Action Committee of Telangana Employees, Gazetted Officers, Teachers, Pensioners & Workers T.S., Hyderabad, dt. 28.3.2018. 3. This adhoc rule shall come into force with immediate effect and shall be in force up to 31.8.2018.